When you do art fairs and shows, your booth becomes the external face of your business. It has to look presentable while still being portable and easy to set up/take down. I'm not a fan of booths which look like they were made for trade shows. They look sterile and undercut the hand-made feel that you want to cultivate at an arts and crafts fair. Hand-made booths can look great, but are often difficult to put up and take down. 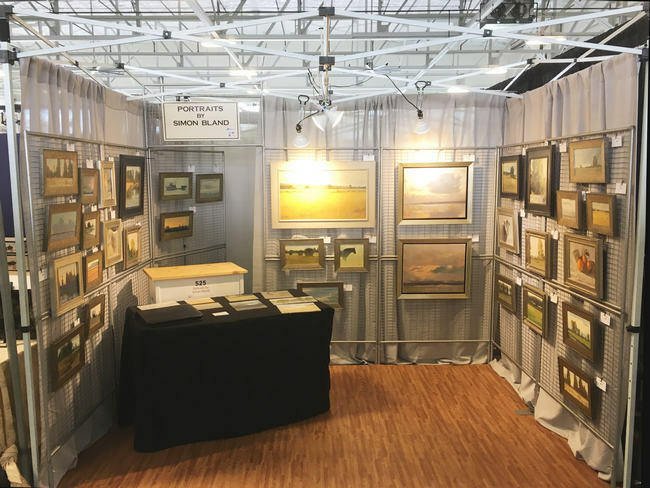 Finding a balance between these two types of booths while also keeping your display simple is the key to letting your paintings take center stage. I often trade ideas with other artists about booth setup—especially tips on where we get our "stuff". I thought it would be helpful to jot down some notes on my display and tell you where everything comes from. My booth set up at an indoor event. 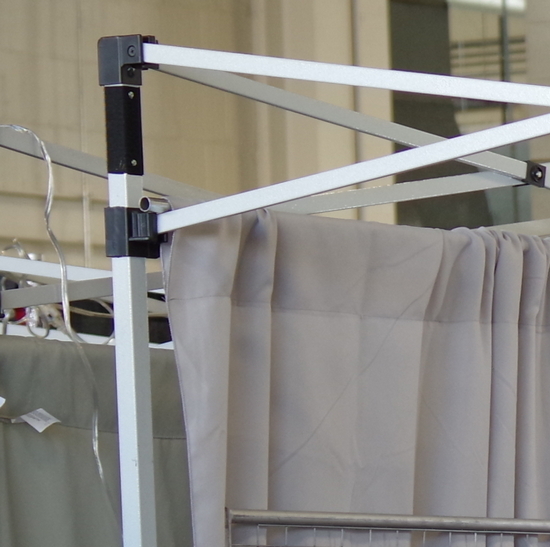 For indoor events I hang drapes and set up lighting using a tent frame without the canopy—super light, easy to set up and fits comfortably in the station wagon. I use a Caravan Canopy steel frame. The grid walls are by Graphic Display Systems. I have seven panels that I use with flat bases for indoor events and standard feet for use on grass. The lights are artist's clamp lamps with PAR 38 LED bulbs. I would prefer a true full-spectrum light like you might get from a halogen bulb, but the advantage of these is that they don't get hot—in fact, you can comfortably hold the bulb while the lights are on. The wiring gets routed to a power strip in the back of the booth so I can easily flip the lights on and off. The floor is Alessco "softwoods" trade show flooring. It covers the front part of the booth where the public stands (the storage area at the back is left uncovered). It makes the booth look a bit more upscale and reflects a warm light back on the artwork. My booth has changed over time, especially since I started doing indoor events. Before every show I try to make small improvements and look for ways to further reduce the amount of equipment. One such change is that I now use drapes that hang from 1/2" electrical conduit. The conduit is cut into 5' lengths and is joined with standard connectors which can be screwed together. They rest on the tent frame support bars. You can buy the conduit and fittings at most hardware stores. I found the drapes on Amazon. Nothing fancy: they're just standard polyester trade show drapes. The one component that's truly custom is the home-made white shelving unit behind the table. I use it as a storage place during the show where it keeps things out of public view. Despite its size, it takes up almost no extra space in the car— it doubles as a container for transporting all the small paintings.